You are here: Home / Portfolio / ClimateMaster Inc. 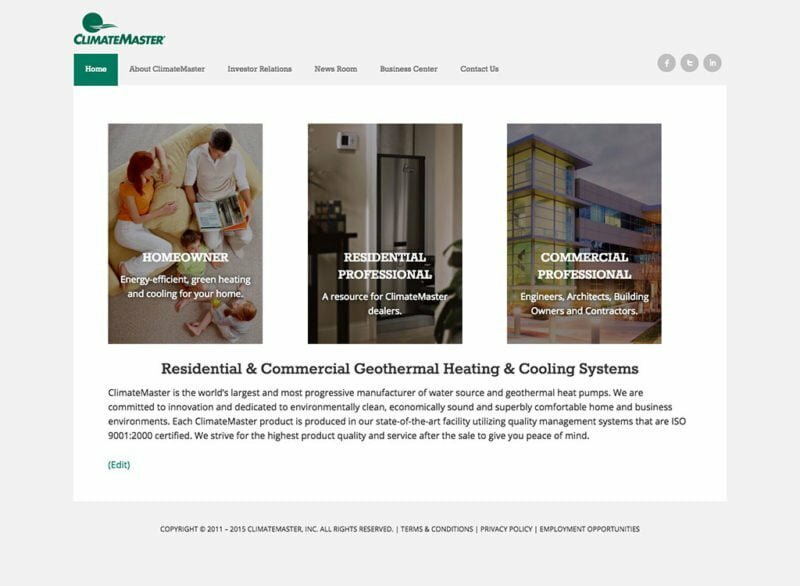 The client is a manufacturer of geothermal and HVAC equipment with a various target audiences: residential end-users, commercial end-users, dealers, installers, architects and engineers. Their websites hadn’t had a major overhaul in some years, and none of them were mobile-ready. We advised them to consolidate all of their sites onto a single platform and a single code-base, i.e., a WordPress MultiSite installation. Phase One of the project is to design a landing site with links to various micro-sites, each aimed at a particular audience, as well as designing the micro-site aimed at commercial professionals.